On July 10th, Chris and over 200 students, parents, and allies stormed the California State Capitol to send this message. Students Can’t Wait. Several students representing 27 districts spoke to the State Board of Education, voicing their concerns and thanking them for the changes they’ve made, while hundreds of students and their supporters held a rally and march from the State Capitol to the State Board of Education meeting. Students have placed themselves at the forefront of the conversation: after testifying and marching outside the State Board of Education meeting, a number of State Board members spoke up in support of student voice! They agreed to look for ways to strengthen the regulatory language around student input. The President of the State Board of Education issued a statement in support of the rise of student involvement they have seen in LCFF locally and at the State level. State Representatives learned about the need for California to do more on Student voice: Students met with 20 elected representatives and collected letters of support to continue to build momentum for the Student Voice Campaign. After months of hard work, the State Board of Education approved revised regulations that included some of the Student Voice Campaign’s demands. Unfortunately, the changes don’t go far enough to ensure that student will have meaningful input in their district budgets. Students can’t wait for their voice to be heard. New funds intended for English learner, low income, and foster students are being spent NOW. State decision makers must ensure that the students generating those funds – the students who spend the majority of their lives in classrooms, who know what they need to be successful – are a part of the budget and decision making process in their schools. 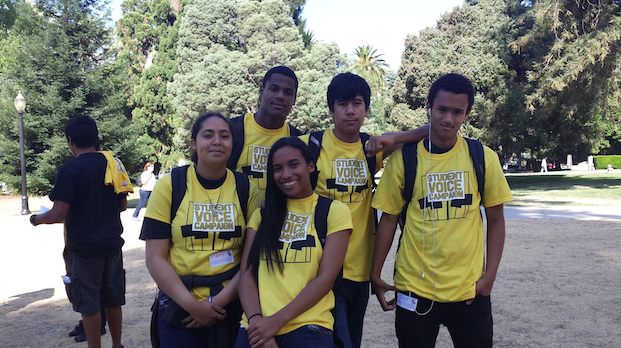 We are asking the State Board of Education, legislators, and Governor Brown to be champions of Student Voice and to continue to improve the LCFF regulations to require districts to formally and meaningfully include students in their budget decision making. Please stay tuned for further updates and next steps as we make the final push to get Student Voice written into the LCFF regulations. Check out the Student Voice Matters video to learn more about the campaign, and to hear from students themselves! P.S. Selfies for our “10 Days: Countdown to Student Voice” Online campaign have been pouring in! Take a look. ← The Students United Will Never Be Defeated!